FMR does not have the resources to compete with internet search-engines in providing links to essential and useful resources on refugees, IDPs and statelessness. We provide a search facility for material in FMR and its predecessor RPN, and in addition FMR is searchable on Forced Migration Online. This is the Refugee Studies Centre’s (RSC) portal to a wide variety of other online sources too, including a range of research guides on a number of forced migration-related themes. In addition to our own institutional home in the Refugee Studies Centre, there are other centres and research institutes focusing on forced migration. 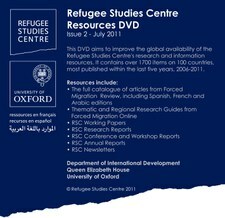 Back issues of FMR in English, French, Spanish and Arabic, up to and including issue 37, are available on a DVD produced by the Refugee Studies Centre in 2011. The DVD includes all RSC publications up to March 2011 on one easily searchable DVD – available free of charge. It contains over 1,700 items, available either as web pages or PDF files, subdivided by geographical area and by theme.